Noah's Ark was said to have been made of gopher (cypress) wood, a kind of timber which was used by the Phoenicians for building their vessels because of its lightness and durability. The planks of the ark, after being put together, were protected by a coating of pitch, or bitumen, both inside and outside, to make it water-tight, and provide protection against the attacks of marine animals. 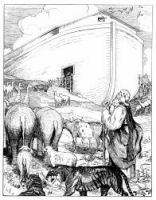 Noah's ark contained a number of small compartments for the convenient distribution of the different animals and their food. These were arranged in three tiers, one above another. There was also a means for letting light and fresh air into the ark. The ark was supposed to have been 525 feet in length, 87 feet in breadth, and 53 inches in height. It was only intended to float on the water, and was not in the proper sense of the word, a ship. It had neither mast, sail, nor rudder; it was in fact, an enormous floating house. The inmates of the ark were Noah and his wife and his three sons with their wives. Noah was directed to also take animals of all kinds int the ark with him that they might be preserved alive. On this page you'll find eight images of Noah's Ark taken from my collection of antique Bibles and story books. You're welcomed to use these pictures of Noah's Ark in your artistic creations. Click on the Noah's Ark illustations below to see more details about saving a free Noah's Ark image or about purchasing the images of Noah's Ark at a higher resolution.